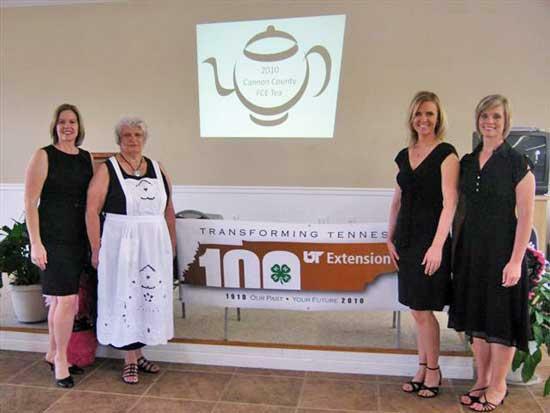 Hostesses for the Spring FCE Tea were, from left, Carla Bush, UT Extension FCS Agent; Kitty Bush, FCE member; Kim Smithson, UT Extension Administrative Assistant; and Erin Nichols, UT Extension, TNCEP Program Assistant. High tea was served to Family and Community Education Club members and guests on Tuesday, April 13 at the Senior Citizens Center. The 2010 Spring FCE Tea was held in order to recognize the contributions and accomplishments of FCE Clubs and to celebrate the UT Extension Centennial. Eighteen members and guests were welcomed to the event by Carla Bush, Family and Consumer Sciences UT Extension Agent. Merrile Byars lead the devotion and prayer for our group. The story of the first home demonstration club was shared with the group by Mrs. Bush. This was taken from the “Cannon County Home Agents” by the Cannon County Historical Society published the summer of 1988. Jean Treanor Adams Blankenship, one of Cannon County’s first home demonstration agents, recorded that Fannie Bell Carter Caffy invited her to her home and help recruit others in the Bradyville community to start the first “home dem.” meetings. This was followed by Margie Jowers McFerrin sharing her memories of being a home demonstration agent. She had a dual role with 4-H youth responsibilities and total responsibility of the Home Demonstration clubs. There were nine clubs at the time: Amity, Auburntown, Bradyville, Ivy Bluff, Moocher Hollow, Gassaway, Readyville, Short Mountain, and Woodbury. All of the clubs met once a month, usually in the home of the officers. There were demonstrations on mattress making, tomato canning, pressure cooking, laundry, upholstery workshops, chair caning, and various other educational meetings. Two awards were given during the event. The Friend of FCE was named Kay Currie who served as the part-time FCS Agent for 2009. Her contributions included leading groups to region events, pottery classes, and having the cultural arts display and recognition event at the Cannon Arts Center. The other award was the 2009 FCE Member of the Year. Sheila Long was selected for this recognition due to her participation in county and region events, as well as she has numerous volunteer hours as an FCE member at the Senior Center as the Silver Sneakers instructor. And for those who are interested in the food that was served that day. The menu included three courses of Boston brown bread, scones, muffins, banana bread served with strawberry jam, lemon curd, and honey butter. The second course was egg salad sandwiches, cucumber sandwiches, open-faced pimento cheese and open-faced pineapple peanut. The third course, being dessert, was thumbprint cookies, crème puffs and pecan tassies. This was all served with an assortment of teas. Serving as hostesses for the event were Kitty Bush, Kim Smithson, and Erin Nichols. Thank you to these ladies for making this event a huge success.